Recycling is becoming more and more popular as a way to be environmentally friendly. Old tires are a good product that can be repurposed for many uses. This includes road material, insulation, and new tires. If you are interested in eco-friendly options for old rubber, then look at a few ways to recycle tires. There are many cool ways to recycle tires around your home, at a business, and even in a city. You can use old tires to make a piece of art or for a functional use. There are many options available based on a need or preference. Creativity is a must when looking at ways to recycle tires. Old tires can be used to make a planter for a garden or to put in front of your home. 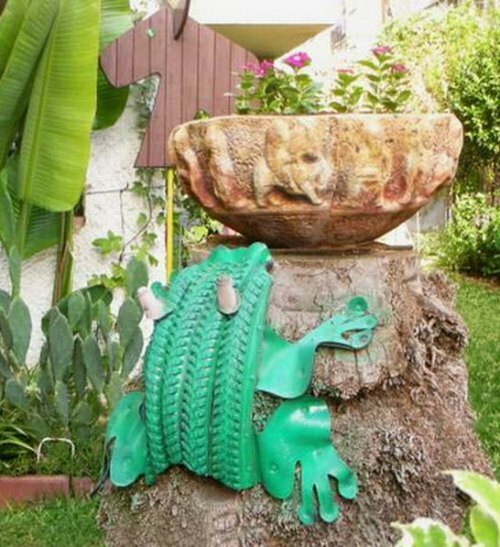 If you need to find ways to recycle tires, then consider making a piece of art. You have the option to cut the tires in two or combine them into a unique shape. Another thing to do is use old tires to make animals. Brainstorming for ways to recycle tires is a great way to come up with unique ideas. Old tires can have paint added to transform them into something that is completely new. Making furniture for use outside is also something to consider. One of the important things to keep in mind is the tools that will be needed to cut and shape your old tires into a new design. Tires that are no longer useful can easily serve a functional purpose. This includes making a flower pot that can hang from a rope or chain. The creative ideas for old tires are plentiful and will only require the use of your imagination. Good ways to recycle tires in public places is to make something that is useful like a chair or bike rack.